Polder Digital Timer on a String – This timer is invaluable. 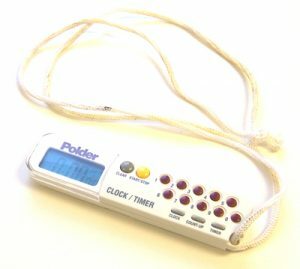 If you are moving around doing various other jobs, you can put it around your neck, so it reminds you when your recipe is done no matter where you are. It also has a magnet on the back if you want to mount on a metal surface. 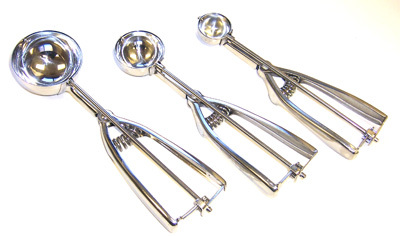 Spring Loaded Ice Cream Scoops – These stainless steel ice cream scoops can be used for dozens of things. 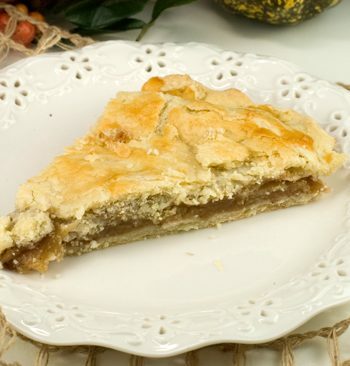 I am always thinking of shortcuts when making recipes, as time is certainly valuable these days. I use the medium or large scoops for meatballs. It makes rolling them so much easier. I use the smaller or medium scoop for cookies. I use the small scoop for stuffing mushrooms. 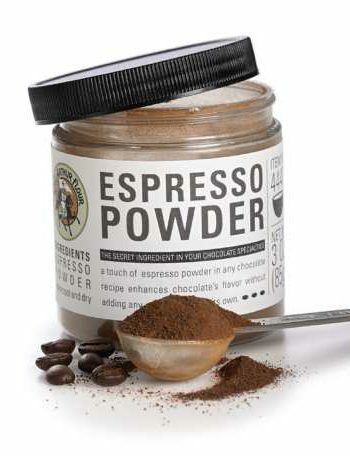 Its perfect for stuffing the huge “stuffing sized” mushrooms to name a few. Thermapen Instant Read Thermometer – This instant read thermometer is a must when cooking meat of any kind. 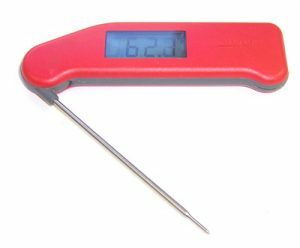 Temperature is the best way to know if your meat or chicken is done. There is no guessing involved. This thermometer “instantly” tells you the internal temperature of anything. It’s a bit pricey, but one of those things you’ll be glad you bought, as you will have it forever! 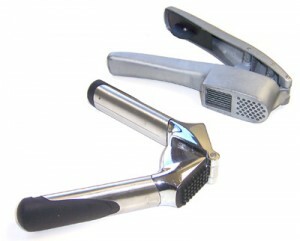 Alligator Onion Dicer– I know that knife skills are extremely important when cooking various meals. No one knows that more than I. The better you are at it, the least likely you are to have an accident. But no matter how good you are, cutting onions is always a pain, because if you tear up and can’t see what your doing, what good are knife skills? This onion cutter is something I reach for every time I want a small sized dice of onions. I love this so much I have extra ones in case my breaks and they don’t make it any more. I have seen other versions with a reservoir to catch the diced onions, but find those too cumbersome. This unit is small, stacks right on top of my mandoline, and is invaluable to me. 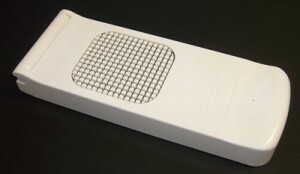 Microplane Hand Graters – I have many of these graters; all different types and sizes. Whether I want shaved parmesan to top my Ziti & Broccoli with Garlic Cream Sauce, minced ginger for my Great Chinese Stir Fry or just some lemon zest, they are ready to assist me in getting the job done quick and easy. 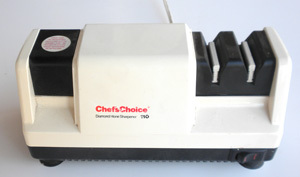 Electric Knife Sharpener – OK, I’ve already admitted it. I like shortcuts for everything. So this electric knife sharpener is an invaluable tool. I store it so its easily accessible, so I can pull it out and sharpen all of my knives at once, and they ready to use when I need them. Garlic Press – I own two garlic presses. 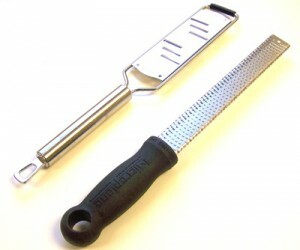 A Oxo for mincing (black handle), and a Amco for mincing and slicing. To be honest, I don’t use the slicing press very much. The concept seemed neat, but I guess I just use minced garlic the most. I’ve owned many, many garlic presses, and this Oxo is by far the most easy to use, clean and dependable. The others have removable, plastic pieces that clean the press, which over time you lose, and so much for the garlic press. The plastic cleaner on the Oxo is built onto one side of the handle, so you swing the handle over to clean. I’ve had mine for 2 years or so, and its still working perfectly. 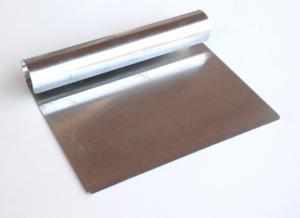 Pastry Scraper – This scraper is an invaluable tool for me, especially when chopping vegetables, but is also handy for bread dough, cookies, or basically anything. Silicone Spatulas – I think I have literally about 15 of the is various types! These are a must for scraping bowls and cooking scrambled eggs, not to mention they are handy for using with your non-stick pans. I have an All-Clad slow cooker that has a non-stick finish and bought the more heavy dutier style to use with that at William-Sonoma. I use them for everything.